MILAN, Italy – “The 3D Bar” is absolutely, the first bar, completely 3D printed by an anthropomorphic-robotic system. A project unique of its kind, that demonstrates how design and technology could be thought in an environmental optic/point of view, with results never seen before. 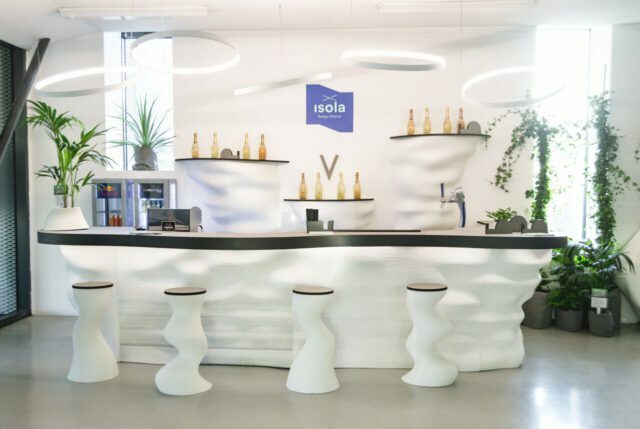 The organic forms of “3D Bar” in fact are realized/developed through a generative design process, drawn up by Caracol Studio designers, who used waste material from the production of single use coffee capsules GEA from Flo SpA. Especially, the 3D Bar, was realized with residual Ingeo PLA, a technical biopolymer 100% bio based and biodegradable, that you can throw away after use in organic waste. This process is necessary for obtaining qualitative compost and release the coffee who is contained in it, as an important plant fertilizer. “We are excited to contribute to realizing 3D Printed Bar – explains Erika Simonazzi, Flo SpA Marketing Manager -. Our products are all recyclable and/or biodegradable and compostable. With this project we have the possibility to follow them to a new life, that keep/preserves, actually it increases its original value”. Part of the raw material used in GEA production, isn’t converted, for technology reasons and it remains an industrial waste, that maintains all the characteristics of the first original material. Thanks to the encounter between 3D technology we are able not to waste this material, but to evaluate it in respect of the logics of a perfect circular economy. “The 3D Bar” represents in fact Flo SpA company goals, that can be summarised in the concept of “Zero Waste”, zero trash. Zero Waste means discard nothing, give new life to material through recycle virtuous processes of the products after use or through the use of production wastes. Besides compostable GEA capsules, recoverable after use through organic recycle, there are other “Zero Waste” Flo projects, for example the ambitious “Rivending” project, characterized by recovery and recycle of automatic distribution plastic stirrers and cups. “The plastic materials used for our packaging – explains Erika Simonazzi – whether they are polymers of petrol origin either they are bioplastics of renewable resources, they are an important environmental resource, because they are 100% for several times recyclable, without wasting their original features. At least they could and should be recycled in order to preserve their value. It will be possible to visit “The 3D Bar” during all the Milan Design Week, until 14th April, in the centre of Design District Island, at first floor of Stecca 3.0, in de Castillia street, 26 from 10 a.m. to 23 p.m. All the cocktails and drinks are prepared by Isola Design District bartenders. Flo is a historic brand in the production of food packaging and cups for automatic distribution. The company, based in Fontanellato (Parma – Italy), was founded in 1973 by Antonio Simonazzi. While maintaining a strong link with the territory it belongs to, Flo is today one of the major European players in the sector.